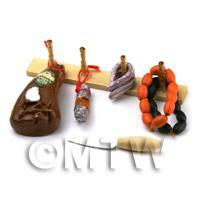 Your Search Results for "Accessories"
We found 596 items that matched your search. 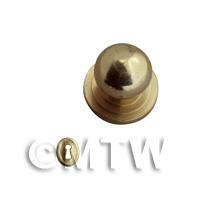 Product ID: 204 Gold coloured metal base with a glass flower shaped shade. 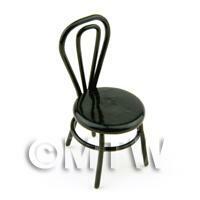 This item is just one of our many lights that you can choose from to add that perfect finish to your dolls house. Our electric Lights will come fitted with 12v bulbs and unless stated otherwise bulbs are replaceable. 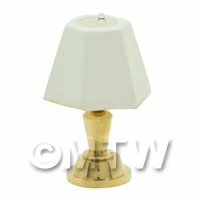 Product ID: 205 Metal base with white lampshade. 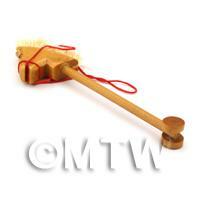 This item is just one of our many lights that you can choose from to add that perfect finish to your dolls house. Our electric Lights will come fitted with 12v bulbs and unless stated otherwise bulbs are replaceable. 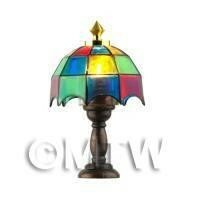 Product ID: 209 Multi-coloured Tiffany lampshade.Base on lamp is metal, as is the top. 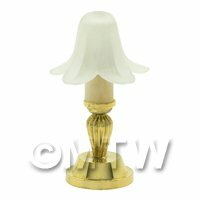 This item is just one of our many lights that you can choose from to add that perfect finish to your dolls house. Our electric Lights will come fitted with 12v bulbs and unless stated otherwise bulbs are replaceable. 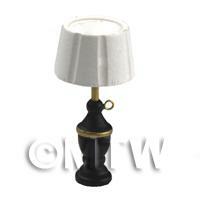 Product ID: 210 The lamp base is metal (gold coloured) and the lamp shade is clear plastic. The center of the lamp (around the bulb) is made of glass. 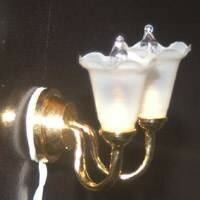 This item is just one of our many lights that you can choose from to add that perfect finish to your dolls house. 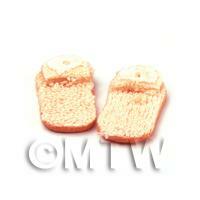 Our electric Lights will come fitted with 12v bulbs and unless stated otherwise bulbs are replaceable. 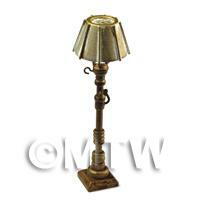 Product ID: 219 Lamp is made from metal (gold coloured) with 2 fluted lamp shades. This item is just one of our many lights that you can choose from to add that perfect finish to your dolls house. Our electric Lights will come fitted with 12v bulbs and unless stated otherwise bulbs are replaceable. 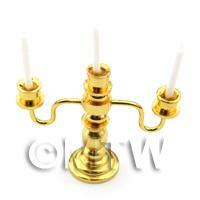 Product ID: 232 A lovely gold coloured stand with 3 lights at different levels. 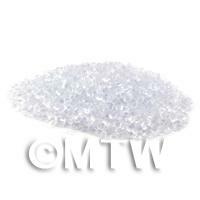 This item is just one of our many lights that you can choose from to add that perfect finish to your dolls house. Our electric Lights will come fitted with 12v bulbs and unless stated otherwise bulbs are replaceable. 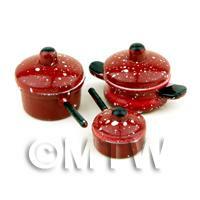 Product ID: 384 A beautiful 3 piece set comprising of 2 saucepans and 1 cooking pot in red with white specks. The lids are removable so you could fill them with items from our butchers or grocers range.This accessory is part of our affordable range of 1:12th and 1:24th scale dolls house miniature accessories, providing a quick and effective way of furnishing all of the rooms in your dolls house. 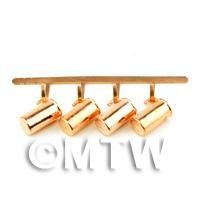 Product ID: 385 This is a set of 1:12th scale loose brass cups which hang from a wall mounted brass rack.This accessory is part of our affordable range of 1:12th and 1:24th scale dolls house miniature accessories, providing a quick and effective way of furnishing all of the rooms in your dolls house. 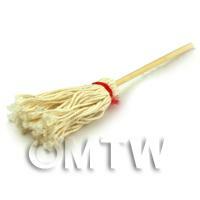 Product ID: 386 This Wooden mop with a string head is ideal for a kitchen scene.This accessory is part of our affordable range of 1:12th and 1:24th scale dolls house miniature accessories, providing a quick and effective way of furnishing all of the rooms in your dolls house. 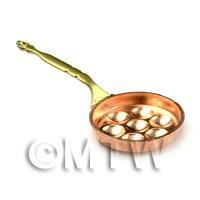 Product ID: 387 This old style brass coloured mini pancake maker would look great in any kitchen scene.This accessory is part of our affordable range of 1:12th and 1:24th scale dolls house miniature accessories, providing a quick and effective way of furnishing all of the rooms in your dolls house. 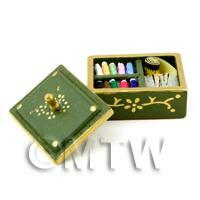 Product ID: 390 This is a lovely 1:12th scale sewing kit that includes fabric, tape measure and needles.This accessory is part of our affordable range of 1:12th and 1:24th scale dolls house miniature accessories, providing a quick and effective way of furnishing all of the rooms in your dolls house. 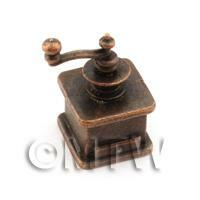 Product ID: 391 This is a 1:12th scale metal coffee grinder, a great additional item for any dolls house kitchen.This accessory is part of our affordable range of 1:12th and 1:24th scale dolls house miniature accessories, providing a quick and effective way of furnishing all of the rooms in your dolls house. 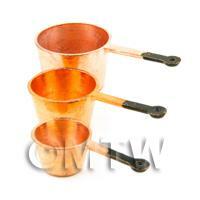 Product ID: 396 This is a 3 piece copper pan set with black painted handles.This accessory is part of our affordable range of 1:12th and 1:24th scale dolls house miniature accessories, providing a quick and effective way of furnishing all of the rooms in your dolls house. 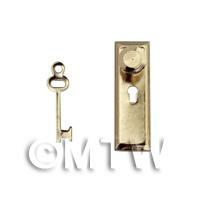 Product ID: 400 A fine brass 1:12th scale key that fits perfectly into an equally fine door handle. Suitable for both interior and exterior doors.This accessory is part of our affordable range of 1:12th and 1:24th scale dolls house miniature accessories, providing a quick and effective way of furnishing all of the rooms in your dolls house. Product ID: 401 This 1:12th scale brass door handle is useful for both interior and exterior doors.It is finished off perfectly by the accompanying keyhole cover.This accessory is part of our affordable range of 1:12th and 1:24th scale dolls house miniature accessories, providing a quick and effective way of furnishing all of the rooms in your dolls house. 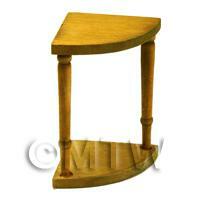 Product ID: 404 This lovely wooden corner table would really look perfect in a kitchen, living room or dining room, and is suitable for any style of dolls house.This accessory is part of our affordable range of 1:12th and 1:24th scale dolls house miniature accessories, providing a quick and effective way of furnishing all of the rooms in your dolls house. 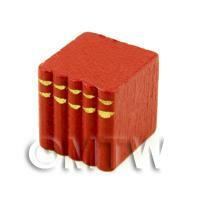 Product ID: 408 This set of 1/12 scale red books can be used around a dolls house to decorate shelves or sides in numerous rooms. 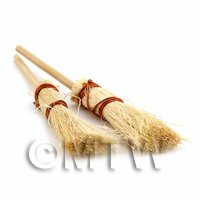 We have a large and diverse range of quality accessories which often add the finishing touch to many scenes in a quick, simple and affordable way. 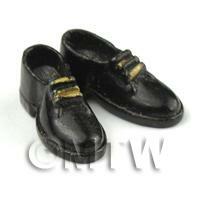 Product ID: 409 A Lovely Pair of black painted metal mens shoes.This accessory is part of our affordable range of 1:12th and 1:24th scale dolls house miniature accessories, providing a quick and effective way of furnishing all of the rooms in your dolls house. Product ID: 411 This is a beautiful wooden wall mounted meat rack, which includes sausages, black pudding, salami and a cured leg of pork.A perfect item for any kitchen wall.This accessory is part of our affordable range of 1:12th and 1:24th scale dolls house miniature accessories, providing a quick and effective way of furnishing all of the rooms in your dolls house. Product ID: 412 This is a lovely pair of ladies slippers.This accessory is part of our affordable range of 1:12th and 1:24th scale dolls house miniature accessories, providing a quick and effective way of furnishing all of the rooms in your dolls house. Product ID: 413 A lovely old style 1/12th scale dolls house black telephone.A Perfect item for the older style dolls house.This accessory is part of our affordable range of 1:12th and 1:24th scale dolls house miniature accessories, providing a quick and effective way of furnishing all of the rooms in your dolls house. 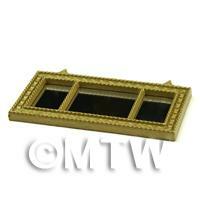 Product ID: 415 A lovely small gold coloured mirror with beautiful patterning. 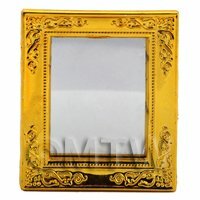 This mirror is an ideal accessory for any dolls house.This accessory is part of our affordable range of 1:12th and 1:24th scale dolls house miniature accessories, providing a quick and effective way of furnishing all of the rooms in your dolls house. 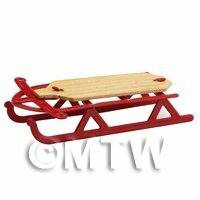 Product ID: 416 This is wonderful 1:12th scale miniature hobby horse that would be an ideal accessory for a childs playroom or nursery.This accessory is part of our affordable range of 1:12th and 1:24th scale dolls house miniature accessories, providing a quick and effective way of furnishing all of the rooms in your dolls house. 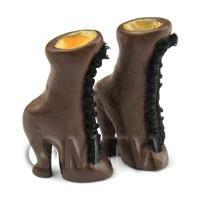 Product ID: 417 This an elegant pair of 1:12th scale womenâ€™s Victorian style boots .This accessory is part of our affordable range of 1:12th and 1:24th scale dolls house miniature accessories, providing a quick and effective way of furnishing all of the rooms in your dolls house. 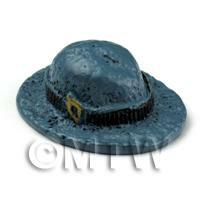 Product ID: 418 A 1:12th scale dolls house blue womens explorer hat.We have a large and diverse range of quality accessories which often add the finishing touch to many scenes in a quick, simple and affordable way. 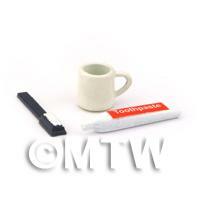 Product ID: 420 A miniature toothpaste, toothbrush and mug set that is ideal for finishing your dolls house bathroom.This accessory is part of our affordable range of 1:12th and 1:24th scale dolls house miniature accessories, providing a quick and effective way of furnishing all of the rooms in your dolls house. 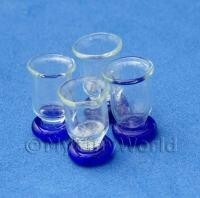 Product ID: 421 A 1:12th scale 4 piece glass set with blue bottoms. 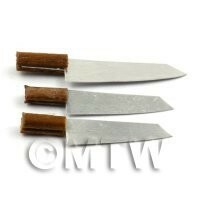 These would be ideal for a kitchen or dining room scene.This accessory is part of our affordable range of 1:12th and 1:24th scale dolls house miniature accessories, providing a quick and effective way of furnishing all of the rooms in your dolls house. Product ID: 425 This large 1:12th scale dolls house mirror is finely detailed with gold colouring and is split into 3 sections.This accessory is part of our affordable range of 1:12th and 1:24th scale dolls house miniature accessories, providing a quick and effective way of furnishing all of the rooms in your dolls house. Product ID: 426 This miniature metal candelabra will come complete with 3 realistic looking candles.This accessory is part of our affordable range of 1:12th and 1:24th scale dolls house miniature accessories, providing a quick and effective way of furnishing all of the rooms in your dolls house. 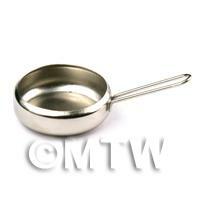 Product ID: 429 A set of 4 miniature saucepans, they are an ideal accessory for your kitchen scenes and preparation boards.We have a large and diverse range of quality accessories which often add the finishing touch to many scenes in a quick, simple and affordable way. 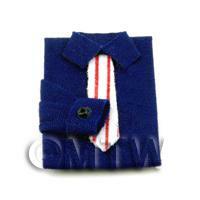 Product ID: 431 This is a lovely dark blue folded shirt with a red and white striped tie.This accessory is part of our affordable range of 1:12th and 1:24th scale dolls house miniature accessories, providing a quick and effective way of furnishing all of the rooms in your dolls house. 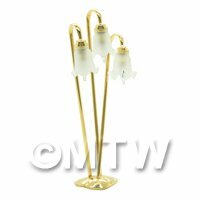 Product ID: 434 This is a gold coloured standing lamp with lovely gold lampshade.Please note this is a non working light. 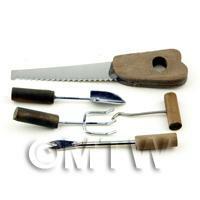 Please see our Electric light section for working items.This accessory is part of our affordable range of 1:12th and 1:24th scale dolls house miniature accessories, providing a quick and effective way of furnishing all of the rooms in your dolls house. 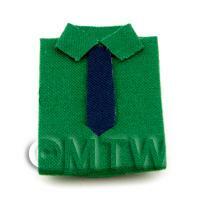 Product ID: 437 A lovely green folded shirt with a dark blue tie.This accessory is part of our affordable range of 1:12th and 1:24th scale dolls house miniature accessories, providing a quick and effective way of furnishing all of the rooms in your dolls house. 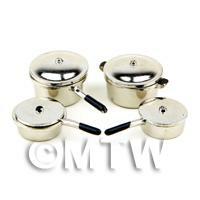 Product ID: 513 A Lovely set of 4 saucepans with painted black handles.The lids are can be removed so you can fill them if desired.This accessory is part of our affordable range of 1:12th and 1:24th scale dolls house miniature accessories, providing a quick and effective way of furnishing all of the rooms in your dolls house. 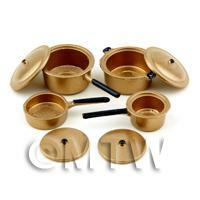 Product ID: 545 This yellow 3-piece bathroom set comes complete with standing sink, bath and toilet. The bath comes on for 4 matching coloured feet and the set is finished with gold coloured plug and flusher.This accessory is part of our affordable range of 1:12th and 1:24th scale dolls house miniature accessories, providing a quick and effective way of furnishing all of the rooms in your dolls house. 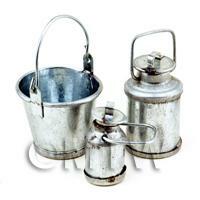 Product ID: 546 This beautifully crafted 3-piece bathroom set comes with bath, standing sink and toilet. The green leaved and white flower pattern goes well with the gold coloured taps and flushing handle and plug that finishes this excellent bathroom suit.This accessory is part of our affordable range of 1:12th and 1:24th scale dolls house miniature accessories, providing a quick and effective way of furnishing all of the rooms in your dolls house. Product ID: 547 This lovely blue and white rose design comes out beautifully on the lovely dolls house bathroom set. 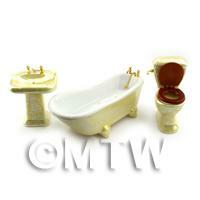 Both bath and sink come with gold coloured taps and plug and the toilet comes with a gold flusherThis accessory is part of our affordable range of 1:12th and 1:24th scale dolls house miniature accessories, providing a quick and effective way of furnishing all of the rooms in your dolls house. 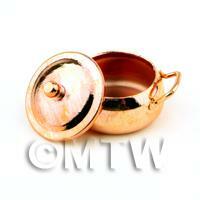 Product ID: 566 This is a lovely large copper coloured casserole pot with a removable lid so, if you wanted you could fill it with foods from our butchers or grocers range.This accessory is part of our affordable range of 1:12th and 1:24th scale dolls house miniature accessories, providing a quick and effective way of furnishing all of the rooms in your dolls house. 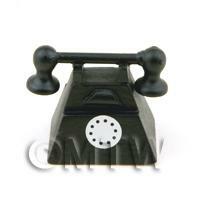 Product ID: 586 This old style looking telephone is just perfect for any of your dolls house scenes.This accessory is part of our affordable range of 1:12th and 1:24th scale dolls house miniature accessories, providing a quick and effective way of furnishing all of the rooms in your dolls house. 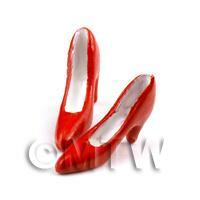 Product ID: 588 A Lovely Pair of red painted metal ladies high heeled shoes.This accessory is part of our affordable range of 1:12th and 1:24th scale dolls house miniature accessories, providing a quick and effective way of furnishing all of the rooms in your dolls house. Product ID: 623 These are 1:12th scale dolls house ice cubes, perfect for all your fishmarket scenes.Each bag Contains 4 tablespoons of ice cubes weighing approx 40g.This accessory is part of our affordable range of 1:12th and 1:24th scale dolls house miniature accessories, providing a quick and effective way of furnishing all of the rooms in your dolls house.